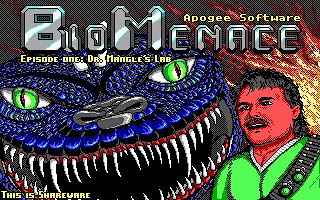 Bio Menace is a side-scrolling platform game developed and published by Apogee Software in 1993. 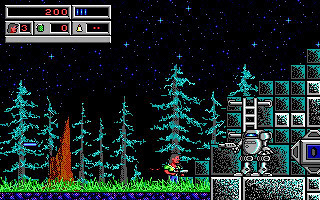 It was built on a licensed version of id Software's Commander Keen game engine, and was known as Bio Hazard during production. In BioMenace, we play Snake Logan, a top CIA operative. 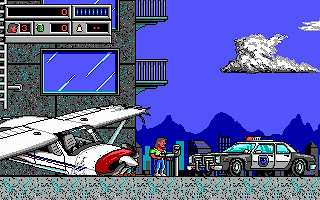 Upon receiving reports of Metro City being invaded by mutants, Snake is ordered to fly recon over the city. However, after crash landing in Metro City, Snake is forced to complete his mission on foot. The basic goal of BioMenace is to control Snake Logan through the levels of each episode, rescuing the hostage and reaching the exit, or killing a boss monster and reaching the exit. 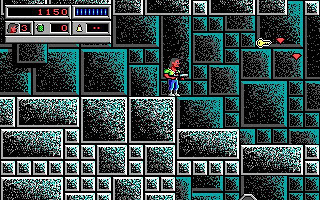 Most levels require Logan to pick up items such as keycards to access new areas, and ultimately, the exit. 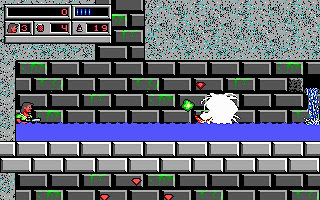 The levels are also full of monsters that can be shot and killed, or avoided. Logan also has the opportunity to collect bonus items to increase his overall score. Snake Logan's default weapon is a gun that shoots regular bullets, but this can be upgraded to shoot different projectiles by collecting various power-ups. Logan can also use hand grenades, found throughout the levels, to kill monsters. He also has access to secret maneuvers that have effects varying from a shield surrounding Snake to a powerful green beam. Monsters have varying amounts of hit points, therefore some require more hits than others in order to be killed. Another interesting point is some monsters cannot be killed at certain intervals, or with certain weapons. You can download BioMenace full version here.